Tonight is the second concert of our South Shore Summer Music Festival series with the Northwest Indiana Symphony. I always like this summer cycle. The music is a good mix of enjoyably difficult material with harmlessly readable tunes, and it's fun watching the conductor, Kirk Muspratt, work the crowd. He's VERY good at it and it's inspiring. Last week at Cedar Lake, we had a significant adventure when, 35 minutes into the concert, a storm blew in very abruptly, toppling some percussion equipment, a large spotlight, and all the pages of music from my stand. We left the stage and dashed for shelter, and waited for ten minutes or so in case it blew over. It didn't. We went home. Tonight we are at St Anthony's Hospital in Crown Point. And we are performing outside again, despite what looks like a very questionable sky here at my home, so I wish us all good luck. And if you happen to find yourself in Northwest Indiana over the next few weeks, try to get to one of these events! They're really a nice time. Details HERE. Zoe just turned seven and she requested a big party and we threw her one. Parties are fun. And there's always more people you can invite - between her friends and our friends, all the brothers and sisters of her friends, people who live in town and people who live out of town - it turned into a big event. I bought lots of food. I went to Costco and bought LOTS of snack foods and meats and paper plates and beers. I planned recipes. I spent two days prepping marinades, making gallons of potato salad, learning a new crock-pot baked bean recipe, making a gluten free cake. When I say it, it actually doesn't sound like an unreasonable amount of effort - but new recipes always feel a little harder than the tried and true ones, and cooking for thirty feels more intimidating than cooking for three. I like to cook. But it was a lot. So on the day of the party, my sister and brother-in-law came in a little early, and my uncle. We were chatting, and laughing, and sort of slowly working on getting tables set up, and vaguely planning how the party would flow, and Steve started up the grill, and then suddenly all of the guests arrived. And from that point on I was running. The hot dip wasn't quite ready. The cooler didn't have ice in it. Grownups who didn't want beer at 3pm were drinking juice boxes because the sparkly water was still in the basement. The burgers were up, but where were the buns? The ketchup? People were scooping potato salad onto their plates but I didn't have forks out yet. No napkins. And as each of these crises emerged, I was completely able to handle it. I HAD napkins, and water, and forks, and I even knew where they were. I was putting out fires left and right, and a little bit congratulating myself on being so on the ball that I could respond instantly to what was needed. More popcorn? Got it. Ice cream to go with the cake? Yes. Candles? Right in this drawer. Garbage bags? Under the sink. Got one. Here it is. And I was pleased that I was able to supply everything the party needed, but I do recognize how much more smoothly everything might have gone if I'd had the napkins, say, on the table in advance. If I'd preset more of the drinks. If there had been an obvious place for ladies to drop their purses instead of everything being completely played by ear. And then I got to thinking. In the orchestra, you should be able to take direction. So if the conductor asks you to play it softer, you should be able to do that. If the flute player asks you to make your articulation shorter, you should be able to do that. And it would be easy to make that requested adjustment, and to make it quickly and easily, and think proudly that you'd done well. But how much better would it have been if you'd actually prepared for that special very soft moment in advance? Had noticed the bounciness of the flutist's articulation before she had to ask you with words? Had known the piece so well that all of your choices were the right ones, the first time? It's important to be able to adjust, but it's even more impressive to have everything well prepared in advance. It's the difference between a professional caterer and ME throwing together a kids party in my backyard. It's the difference between being a good player and being a great musician. And it's the REAL goal. It's finally time. We're done with the season, Dake is over, we've had our vacation, and there's nothing standing between me and recording my first professional CD, except the actual preparation of the actual music. So here we go. I've got all of the repertoire I'm considering up on my stand. (Most is set, there are just a few question marks at the very end.) I've scanned all the piano scores to Paul. I've been practicing and making reeds enough in the last week that I no longer hate myself. 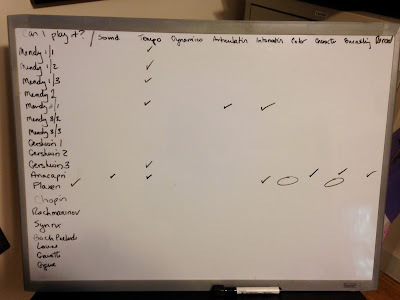 All I need to do now is learn all of my music, to an incredibly high degree of accuracy and awesomeness, so I can lay these tracks down WHEN IT COUNTS and come up with a product I can be proud of. But I've never tried to do this before, not to this extent, not all by myself. I know how to prepare a recital's worth of music, and I know how to perform for an hour in front of an audience. But my preparation needs to be a little different to make a CD. In a live performance, I am always working on managing my energy and my embouchure so that I can get all the way to the end of the program feeling strong. Inevitably, I choose a reed for its functionality over the one that might sound the best, and I choose a reed that's a little too easy so I don't exhaust myself early on. I plan breaths that will get me through long passages with enough reserve oxygen to go forward into the next page and next movement, though in the privacy of my practice room I might prefer different, riskier choices. And although I always strive for technical perfection, I know in my heart that an hour long live performance will not be perfect, and I can forgive an error or two as long as I am performing excitingly. But in a recording studio, when perfection is possible, when I can always go back and do it a little better, or I can change reeds to give me a different sound or level of resistance for the slow movements or the French pieces, and when I can stop and start to give my embouchure a rest in various places - well, I'm not totally sure how to work on that. I'm excited about the possibilities, but I'm not sure how to optimize my time. Thus, I have a chart. I love a whiteboard, and I've made a chart. I've broken up my longest movements into chunks, and I've noted every movement, and I've considered all the aspects of each work that I want to have thought of and worked on. I figure if I can check all of these boxes before I meet my pianist, three weeks from now, two weeks before my session, I should be in pretty good shape. Our rehearsals will illuminate more details for me to work on, and if I keep at it all the way through the end of August we should have a great product to put out there. That, anyway, is my hope. This is the worst. I'm the worst. The first day back on the oboe after 11 days of vacation, following a week of wrangling students through chamber music and orchestral rep - it's been nearly three weeks since I did any playing that I'd consider quality. And coming back hurts. I know it does, because it turns out that nearly every summer I've written this exact same post. HERE, for example, and HERE. It makes it worse this year that the most recent oboe playing I've encountered was at IDRS, where people are just so great. I heard so many fantastic performances. And I was actively listening, and learning, and analyzing, and noticing things I wanted to work on and things I wanted to accentuate. With my most recent habit being analytical listening, and my actual last practice session being three weeks ago, I can't help but notice just how terrible everything feels right now. And because I'm now officially beginning my preparation time for my CD recording, at the end of August, it's even all the more awful. I'm working up the Mendelssohn that I played two years ago, and the Gershwin, and the Bach - and these are HARD pieces, and I'm suddenly reminded of how long it took me to learn them in the first place, and they just feel so lousy today. All of my reeds are too old and bad. My studio is too humid, and my oboe feels out of adjustment, especially compared to the spectacular brand new ones I played at the convention. My face doesn't know how to hold itself. I forget how to do the hard technique. This is not new. Every year I take a little time off, and I feel better for it, AFTER the miserable readjustment period which is right now. It always feels bad, but it won't take long. The first day is the worst, and then things start to come back together. This will not be as bad as I fear. I dragged myself through two sessions today, and will make it happen again tomorrow, and by Day Three or Four I'll be back on this blog talking cheerfully about the tiny tweak I'm working on or about which TV rerun is inspiring me this time. But today, please let me just stew in it. I hate the oboe, I hate reeds, and I hate myself. I hate my CD project. I want a new job, one that is easy. Who's got one of those for me? Who?